The U.S. Air Force has launched two more satellites designed to help keep some of the nation's most valuable military space assets safe and secure. 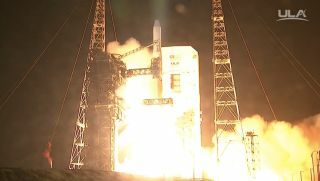 The third and fourth satellites in the military's Geosynchronous Space Situational Awareness Program (GSSAP) lifted off atop a United Launch Alliance Delta IV Medium rocket at 12:52 a.m. EDT (0452 GMT) Friday (Aug. 19) from Florida's Cape Canaveral Air Force Station. If all goes according to plan, the spacecraft will take up positions near geosynchronous orbit (GEO), a region of space about 22,300 miles (35,900 kilometers) above Earth that houses critical military surveillance and communications satellites. Like their two GSSAP predecessors, which launched aboard a Delta IV Medium in July 2014, the newly lofted craft will monitor objects in the GEO belt, watching out for anything that might pose a threat to American satellites there, Air Force officials said. "The first two GSSAP satellites have performed remarkably well," Lt. Gen. Samuel Greaves, Space and Missile Systems commander and Air Force program executive officer for space, said in a statement Thursday (Aug. 18). "These next two satellites will add to that capability and enable us to understand more completely things [that occur] in the geosynchronous orbit to a very high quality," Lt. Gen. Greaves added. "It’s a key piece in the puzzle for space situational awareness." The GSSAP satellites, which were built by Virginia-based aerospace company Orbital ATK, are capable of performing rendezvous and proximity operations (RPO) with other spacecraft, Air Force officials have said. "RPO allows for the space vehicle to maneuver near a resident space object of interest, enabling characterization for anomaly resolution and enhanced awareness, while maintaining flight safety," United Launch Alliance representatives wrote in a description of the Delta IV's early-Friday mission, which was known as AFSPC-6 (Air Force Space Command-6). "Data from GSSAP will uniquely contribute to timely and accurate orbital predictions, enhancing our knowledge of the geosynchronous orbit environment, and further enabling spaceflight safety to include satellite collision avoidance," they added. The GSSAP project was classified until early 2014.